Step right up, the “Sweetheart of the Sideshow” is alive and on the inside at the library! Today at 5pm, sideshow sword swallower and pain-proof girl Ilise “The Lady Aye” Carter is lecturing and performing at The New York Public Library. “Her story exemplifies how overcoming fears can make perceived failures into real opportunities – a skill everyone can benefit from. Live performances of traditional sideshow skills like walking on glass, sword swallowing, and human blockhead make this is a one-of-a-kind experience,” according to the listing. The free event is at the Tompkins Square Branch of the library at 331 East 10th Street in Manhattan’s East Village. 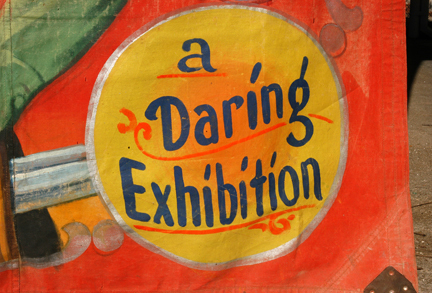 We’ve attended sideshow performances in art galleries and museums but never in a public library. As far as we know it’s a first. Today at 2:22:14pm local time, sword swallowers at Ripley’s Odditoriums in Times Square, Hollywood and several other locations will simultaneously participate in the annual “Big Swallow” for World Sword Swallower’s Day. The free live show begins at 1:30pm. 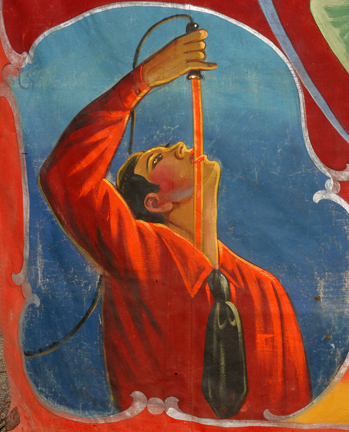 “Because sword swallowing is so rare, sword swallowers usually perform solo,” says Dan Meyer, the president of the Sword Swallowers Association International (SSAI), which co-sponsors the event. “World Sword Swallower’s Day gives us a chance to work together to be part of something bigger.” The annual event promotes this ancient art, honors veteran performers, and raises awareness of the medical contributions sword swallowers have made in the fields of medicine and science. At the Times Square Ripley’s, performers include Todd Robbins, Kyle Mertz and Jim Stileonis. Last year, Robbins’ 5-year old son, Phineas “Finn” Robbins, a Broadway and television actor who often accompanies his famous Dad to sideshow gigs, cutely performed with a toy sword. In St Augustine, Florida, 15-year old Haley Hall, “The World’s Youngest Sword Swallower,” will join multiple Guinness World Record holder Dan Meyer. For World Sword Swallower’s Day 2013, Meyer swallowed a sword and used it to pull a 3700 lb car out of Ripley’s Believe It or Not Baltimore. Video: Happy International Sword Swallowers Day! 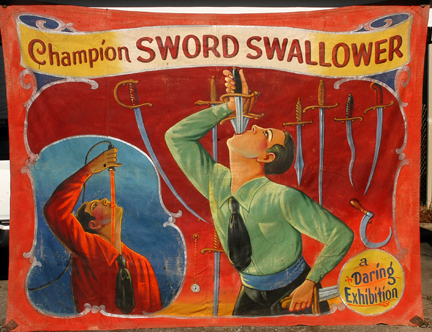 If you’re one of those skeptics who thinks a sword swallower’s sword folds up into the handle or employs some kind of special effect, February 25th’s big swallow should set you straight. 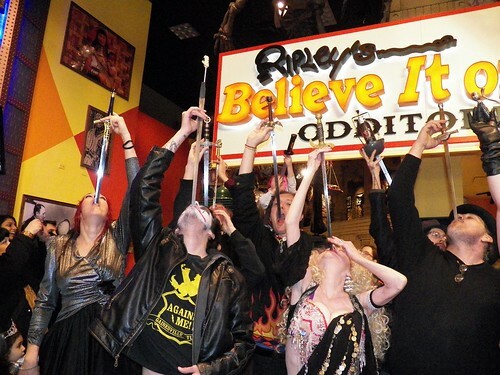 Today, in celebration of the 6th annual World Sword Swallowers Day, more than 30 performers are expected to “drop swords” at Ripley’s Believe It or Not! Odditoriums in New York, London, San Francisco, Hollywood, and Orlando, among other places. Los Angeles sword swallower Brett Loudermilk made these videos three years ago on International Sword Swallowers Day in New York City. One of 10 featured sword swallowers at Ripley’s in Times Square in 2009, this year Loudermilk will be at Ripley’s Hollywood. In New York, today’s free show at Ripley’s begins at 1:30 pm and ends with the big swallow at 2:25 pm. Keith Nelson of the Bindlestiff Family Cirkus and the Lady Aye will be among the Kings and Queens of Swords. “A lot of it is just showmanship. You really have to get the audience with you feeling that it’s real, and then kind of hold them at that edge,” Nelson tells ATZ. In an attempt to convince skeptics in the audience that, as he says, “what I’m shoving down my throat is real,” the Bindlestiff’s charmingly subversive Mr. Pennygaff has also swallowed oversize scissors, sabers, corkscrews, door springs, coat hangers and, in a tribute to good ol’ vaudeville, a rod upon which he has set a spinning plate! The February 25th celebration was started by the Sword Swallowers Association International to promote this ancient art, honor veteran performers, and raise awareness of the medical contributions sword swallowers have made in the fields of medicine and science, according to SSAI founder and multiple Guinness World Record holder Dan Meyer. On Saturday night in Luna Park, we caught the first sideshow performance of the season on the park’s free stage. Emcee and host Todd Robbins aka “Coney Island Todd” did the blockhead act (hammering a nail up one’s nose) and a bit of fire eating before introducing his guests. 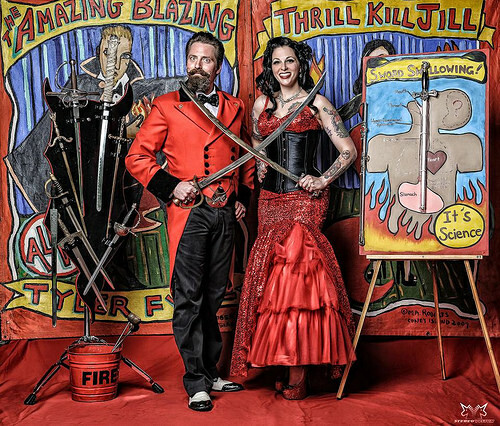 As previously reported in “Will Coney Island Host a Trio of Rival Sideshows?” (ATZ, May 17), Robbins has booked sideshow luminaries like Erik “The Lizardman” Sprague and Natasha Veruschka, the world’s only sword swallowing belly-dancer. Saturday’s show featured MelissaMarie Wilhelm from Cirque-tacular and Queen of Swords Natasha Veruschka. We first wrote about Natasha a decade ago when this modern-day Scheherazade was entertaining high rollers in Las Vegas with a cabaret act torn from the pages of A Thousand and One Nights. “I always looked different from the other belly dancers. I performed differently,” Natasha says. The first time she danced with a balanced sword it felt so natural that the idea of incorporating sword swallowing into her act began to crystallize in her mind. 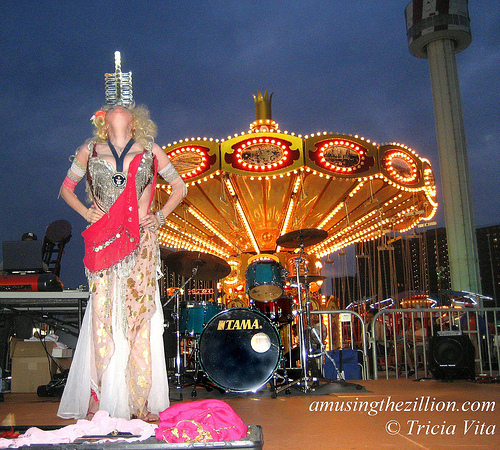 At Luna Park, Natasha swallowed seven 22-inch swords at once. The medallion around her beautiful throat is inscribed “Guinness World Record.” Her sixth and current Guinness World Record is for swallowing seventeen 22-inch swords at once! 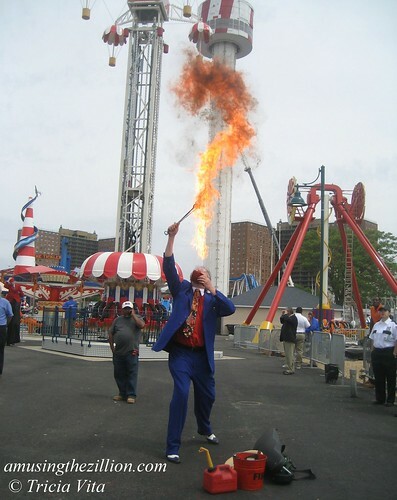 Other acts on Luna Park’s summer schedule include Chris McDaniel, Champion Bullwhip & Trick Roper; Ravi the Scorpion Mystic, Contortionist; and sideshow legends Johnny Fox and Harley Newman. The free sideshows are on Fridays and Saturdays at 8 and 10:15 pm, beginning June 11. August 29, 2010: Video: Grand Prize Winner of Luna Park Coney Island’s Film Contest!